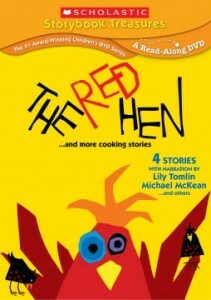 We were recently introduced to one of the newest titles, “The Red Hen.” This fun DVD features stories all about cooking! Since I LOVE to get in the kitchen with my kiddos, I knew this set would be right up our alley! The first story is The Red Hen, by Rebecca and Ed Emberley (I’m a HUGE Ed Emberley fan, so I was excited!) This is the classic story of The Red Hen brought to life for a new generation of readers and viewers. My children loved this story and were able to pick up on the important message. Great discussion is sure to follow this classic tale. The favorite story on the DVD is Bread Comes to Life. I LOVE (love, love, love!) that the DVD includes a non-fiction title. Getting children interested in a wide variety of books, including non-fiction titles is so important. My children sat glued to the tv, watching the story of how bread is made. I’m pretty sure they didn’t move throughout the duration of this story…they were hooked…and then asked to make bread! This story features photographs, and reads like a highly engaging documentary. Are you a fan of the “How do Dinosaurs” series? My dino-lover is, and was delighted to see, “How Do Dinosaurs Eat Their Food?” on this disc. Yolen’s beloved dinos show that the rough-housing, spilling, etc are not the best ways to eat your food. Arnie the Doughnut by Gerald McDermott was a new story to all of us, and I literally found myself laughing out loud! This story is adorably hilarious, and tells the tale of a sweet little doughnut who was confused about his fate. You will love this story, and find yourself wanting to go out and buy the book! You can purchase The Red Hen for just $14.95. Invest in a movie that supports literacy, education, and a love of books! Buy it HERE.